If however you are having problems i.e. missing channels, picture freezing, Poor reception then you may need to upgrade your existing aerials. Call our engineer now on 07902204779 or fill out our contact form for some FREE advice or a quote. 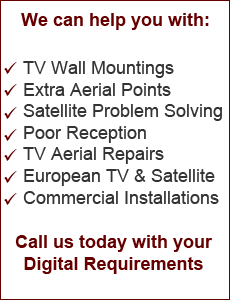 We Install Freeview Aerials in Liverpool, Wirral, Widnes, Runcorn, St Helens and Warrington.